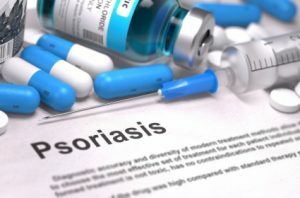 A new study by iData Research estimates that there are nearly 150,000 new cases of psoriasis (PsO) every year in the United States, affecting 2.2% of the population. Approximately 80% of those affected have mild-to-moderate psoriasis, while 20% have moderate-to-severe psoriasis, which is often treated with immunology drugs. These drugs command a high price, but there may be hope for better options in the future. People with psoriasis suffer from the overproduction of skin cells, which causes the redness and inflammation typically found on elbows, knees, or the scalp. The disease is usually associated with other serious health conditions, often involving the immune system. Crohn’s disease and ulcerative colitis are some examples, both of which can be up to 7 times more prevalent in psoriasis patients. Psoriasis patients have a number of treatment options, ranging from non-steroidal anti-inflammatory drugs for initial treatment to biologics, which are more often used in moderate-to-severe forms of the disease. The PsO market is dominated by drugs such as Humira®, Enbrel®,Remicade® and Stelara®, but more competition is coming soon from biosimilars as patents begin to expire. Research by iData shows that the average annual drug cost per patient in the U.S. is over $60,000. Stelara® and Humira® are the most-prescribed immunology drugs for psoriasis treatment, due to their high efficacy, and are clearly benefiting from the lack of competition, which enables them to sell at these prices. The U.S. psoriasis market is valued at almost $5 billion, growing year over year. According to this latest study, the PsO market is expected to reach $6.33 billion by 2023. This market growth is driven by the high cost of the biologics, unmet needs in the psoriasis space, and the efficacy of anti-TNF biologics. “Despite this trend, biologics are seeing a lower growth rate as a direct result of competition from the immunology biosimilar market, which will experience a compound annual growth rate exceeding 30% over the forecast period,” says Dr. Kamran Zamanian, President and CEO of iData Research. AbbVie’s Humira® is expected to remain exempt from biosimilar competition in the U.S. until 2023, due to strong ancillary patents and ongoing litigation with other pharmaceutical companies. The entrance of biosimilars will benefit patients both directly, by providing them with lower-cost treatment alternatives, and indirectly, through applying downward pressure on the cost of the originator biologics. For a limited time, download a free report from this Global Market Report Suite for Immunology Drugs 2018. For over a decade, iData Research has been consulting and conducting market research for top industry players in the pharmaceutical, medical device, and dental industries. Contact iData to learn more about this immunology drugs market, which covers market forecasts, average selling prices and unit analysis for 5 diseases: Psoriasis, Ulcerative Colitis, Crohn’s Disease, Rheumatoid Arthritis and Ankylosing Spondylitis.